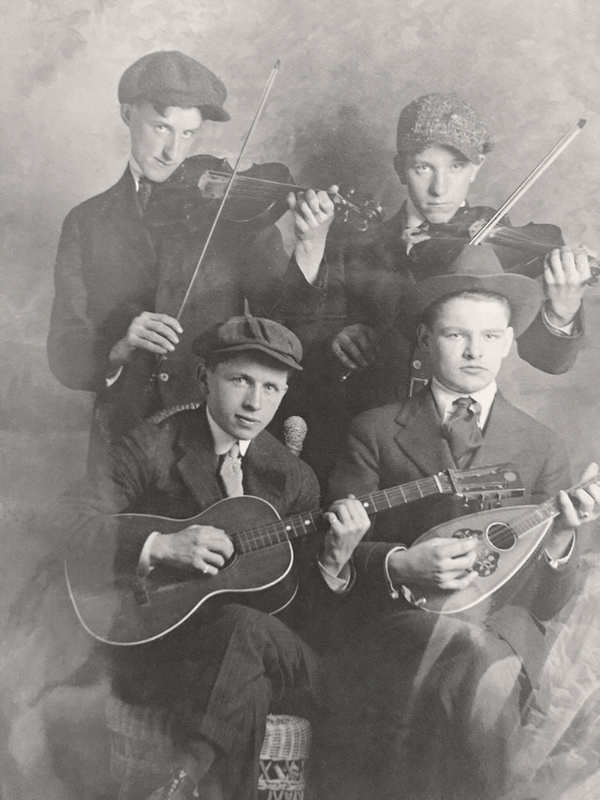 This lovely formal portrait of four young men with musical instruments was shared by a Selker cousin. Presently the only man identified in the portrait is Edward C. Selker. Sr. in the lower right corner. Edward was born March 28, 1894 in Clarion, Clarion County, Pennsylvania - the son of Joseph William Selker and Frances Philomena Guth. There is another formal portrait of Edward C. Selker wearing a similar suit jacket, tie and shirt. The two portraits may have been taken the same day. It is possible that Edward was photographed with his three younger brothers - Frederick William Selker (born 1896), Ambrose John Selker (born 1898) and Vincent Aloysius Selker (born 1900). There are family stories that that all of the Selker children could play a musical instrument and that the family would have concerts on Sunday's. It is also possible that Edward was photographed with his Guth cousins. The two men standing in the back have a similar face shape to an unidentified Guth ancestor photographed with Edward's mother in this Guth Family Portrait. Perhaps in time the other men in the photograph will be identified. Front: Unknown, Edward C. Selker, Sr. This photograph is shared with permission. The original photograph is in the care of Pam Selker Rak, my 2nd cousin 2x. Edward C. Selker, Sr. is the son of Joseph William Selker and Frances Philomena Guth. From the Edward C. Selker Sr. Collection. Photographer Unknown. Editing and digital restoration by Michelle M. Murosky. Joseph William Selker and Frances Philomena Guth are my 2nd great grandparents. Edward C. Selker, Sr. is my 2nd great uncle. His sister Frances Philomena Selker is my great grandmother. Ancestry.com. Pennsylvania, Death Certificates, 1906-1964 [database on-line]. Provo, UT, USA: Ancestry.com Operations, Inc., 2014. Edward C. Selker. Certificate Number: 9002.